Riverbluff Church exists to make disciples who make disciples who change the world! At Riverbluff a “Disciple of Jesus” is devoted to Jesus, and practically seeks to make each day a chance to be with Jesus, to learn from Jesus, and to live the UP, IN, & OUT life of Jesus. “UP” – A growing relationship with God as my intimate, loving Father from which my identity is securely established. 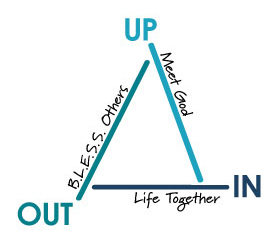 “IN” – A growing relationship with a group of disciples, intentionally “doing life” as family in a Biblically functioning community and together serving the mission of Jesus. “OUT” – As a family on mission intentionally developing relationships with pre-Christians by demonstrating and declaring the Gospel of Jesus. Seeking to give them multiple opportunities to see, hear, and respond to the Gospel where they live work and play. On our journey we’ve learned that the best context for growing Disciples of Jesus is in a “high invitation—high challenge” environment of intentional relationships that properly balance imitation, information and immersion.